Searching of table data is very required feature in any web application, so here we have discuss something like that. 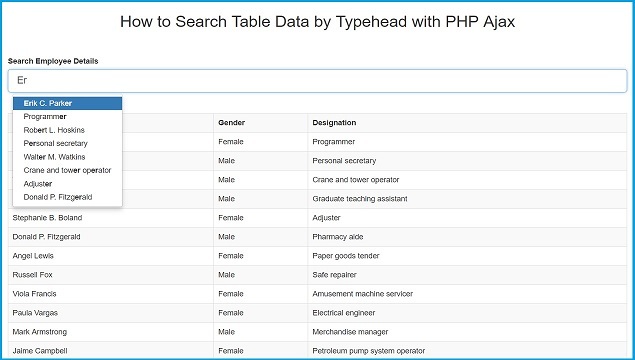 In this post we have learn how to search or filter table data by autocomplete textbox using bootstrap typeahead plugin with PHP script with Ajax Jquery. We have already discuss topic on search html data by using Ajax with Jquery and we have also discuss how to use Bootstrap Typeahead plugin for make autocomplete textbox with Ajax PHP. But now here we have seen combination of both that means we have we have learn how to integrate Bootstrap Typeahead plugin for search table data on server side PHP script with Ajax. Bootstrap Typeahead plugin is used to make Autocomplete that means we have start to type in textbox then it drop down posible data according to what we have type in textbox. In short this plugin add autocomplete feature to any input type textbox to drop down hint to user while he start filling data in textbox. So here we have used this plugin for search table data with autocomplete textbox. For make autocomplete search box for search HTML data by send Ajax request to PHP script. In this feature user can search any table column data. Here first we want to make autocomplete search textbox so for this we have use Bootstrap Typeahead plugin by using typeahead() method, by using this plugin we can make auto completed textbox like Google or any other social media site. Then after we have want to search table data according to hint given by this plugin, so here we have integrate search query in typeahead() method, so when this plugin return possible data from autocomplete textbox then it also display search or filter data on table also. This way we have use Bootstrap Typeahead plugin for search table data by using autocomplete input text. Hello friend, How to put pagination? Ps. :The system is very good, congratulations! how to show more than 8 result in the suggestion box?